Food Label Tips that will Increase Sales and Keep You Out of A Pickle. You’ve probably seen those weekly grocery store newspaper circular ads featuring “fresh” salsa that looks brown, “succulent” oranges that look yellow, and “tasty” burgers that look green. Does the look of these ads motivate you to grab your keys, drive to the store, and buy the products? Probably not. You would NEVER design food labels that print so poorly. Bad design and low-cost print aren’t very enticing to a consumer. While you don’t have to break the bank on your food labels, it is imperative they have eye-catching shelf appeal and consistent color. They also have to meet retailers’ packaging requirements. 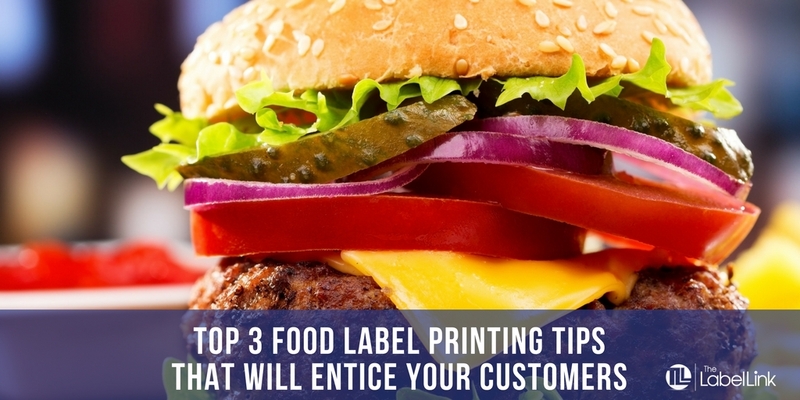 How do you print a great food label that attracts consumers and keeps your retailers happy? We will answer that question and more. Product label design is often the first thing clients ask us about, and it should be. If your products don’t stand out on the shelves, they won’t sell. How do you make them irresistible to consumers and retailers? Especially for food labels, colors must be consistent and vibrant, from lot-to-lot, so your product appears appetizing. Also, your customer may perceive that the food label color variations are due to fading or aging and may not purchase your product because they feel it is old. Your food label image(s) must look authentic (Hint, the key is in the consistency of print & the systems that ensure that.) An amateur graphic design is a recipe for disaster, potentially resulting in lost sales. It is worth hiring a professional graphic designer to create your food labels as this is the primary packaging component to generate sales. They often have several versions of the same product, so SKU management is critical. Being a perishable product, the shelf life is short. Most food labels require a “Best By:” area of secondary print which, in many cases, require special coatings or materials to accept the lot codes correctly. They often require special materials for special conditions like varying temperatures and moisture exposure. It is important to know if the food item will be refrigerated, frozen, baked, or stored in a moist environment as particular food label constructions are made for these conditions. Clear labels or not. More companies are leaning toward clear labeling for a “no label” look, opting for a “fresh” appeal. But you must use the correct inks when printing clear labels so that the color of your contents don’t change the color of your ink. We can work with you to determine if you need to use high-density, silk-screen, or UV inks backed with white-based coatings. Properly marked Food Label Nutrition Facts & UPCs. Most retailers will have a set of guidelines for nutrition facts labeling requirements, and they will need to reflect the recent FDA law guidelines that will take effect in 2018. Also, there are many nuances to securing UPC labels. Be sure to stay in the know! Many Retailers require a prototype food label that looks similar to, or identical to the actual production label. That’s when a digitally printed food label works well. We offer both digital, one-off labels that look and feel similar to your production label that will impress your retail buyer. With digital, the print can be as little as one of each version, back-to-back. And, because there are no plates, costs remain low. Most consumers choose this option. However, if you need an exact print, we offer press proofs, meaning the proofs utilize the actual printing plates and materials on the actual production press (usually a flexographic press). Check out this article on how to determine whether to go with a digital label or flexo label. Proper tracking & marking requirements. In this day of food, This includes UPCs with proof of readability of a grade C or higher. Also, labels should be marked in a way for lot and batch controls which are a measure of FDA compliance. Also, tracking measurements are a key process to the USDA Food Safety & Inspection Services (FSIS), the main certification process for tracking foodborne illnesses. Speaking of FDA compliance, if a food product is labeled (think apples or bananas), FDA materials must be used for direct or indirect food contact. Many retailers have a chargeback if the finished goods are not delivered on time. To avoid an application or fill line shut down because you had a label stock out, or because the delivery was late. We’ve helped clients with customized programs to develop processes that ensure your inventories are sufficient so you can deliver on-time to your customers. Ensure your printer uses Delta E readings for spot colors. Matching color by eye is subjective (not to mention will vary depending upon the light source) and should never be the sole determinant. We use Delta E readings in combination with the Pantone Matching System book, for spot colors and matchprint proofs calibrated to the press to ensure color consistency. Does your printer consistently measure their on time delivery? We see a range of 98 – 99.5% on time delivery. Does your printer work with you to ensure quick turnaround? Most labels can be ready in a two to three-week turnaround. But if you need it sooner, your printer should be flexible enough to accommodate an occasional rush request. Alternatively, they may need to set up an exclusive system for continuous quick turn needs. Question: How do you ensure that the packaging design you submit to your printer is consistent across your product line and across lots? Was this article helpful? Want to stay in the know on the latest label packaging ideas and tips? Sign up for more helpful print packaging emails direct to your inbox.